Let’s Be Wild’s Weekly Photo Challenge this week is “New Beginnings”, which reminded me of a very special memory. 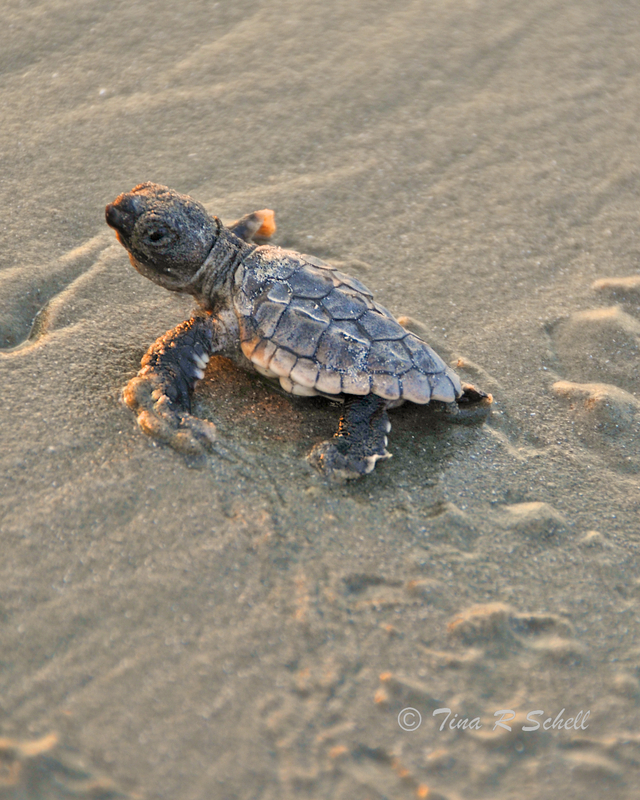 Each spring, on the beach at Kiawah, we are home to hundreds of loggerhead turtle nests. Mature turtles, who can live up to 60 years and weigh up to 300 pounds, crawl onto our shores to lay and bury their eggs. They are guided only by the moonlight and an amazing sense of navigation. Every morning before dawn our Turtle Patrol checks the nests to keep the eggs safe from predators, and to help any stray hatchlings make their way to the water, leading them by flashlight when necessary. One early spring morning, I was privileged to see a single tiny creature beginning her journey. After breaking free of her egg, she struggled to the nearest clump of grass for a short rest. Once she had regained some strength, she began the long crawl across the sand to the ocean, where she would spend the rest of her life. As soon as she started out, it became apparent that she had one misshapen flipper, and her journey would be arduous at best. Because we are not allowed to interfere with or touch the newborn turtles, we could only watch and hope. Although it took her far longer than her brothers and sisters, she eventually found her way to the sea, offering us one final, backward glance before the waves swept her away. 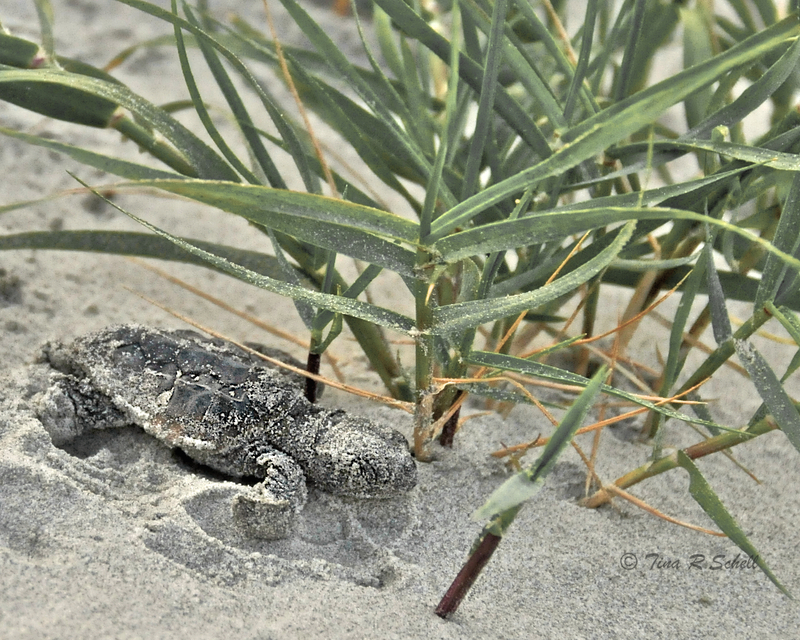 We could only hope she would someday return to build her own nest, full of tiny hatchlings beginning the next generation of lives on our welcoming shores. Awww, thanks KZ. They really are fantastic! 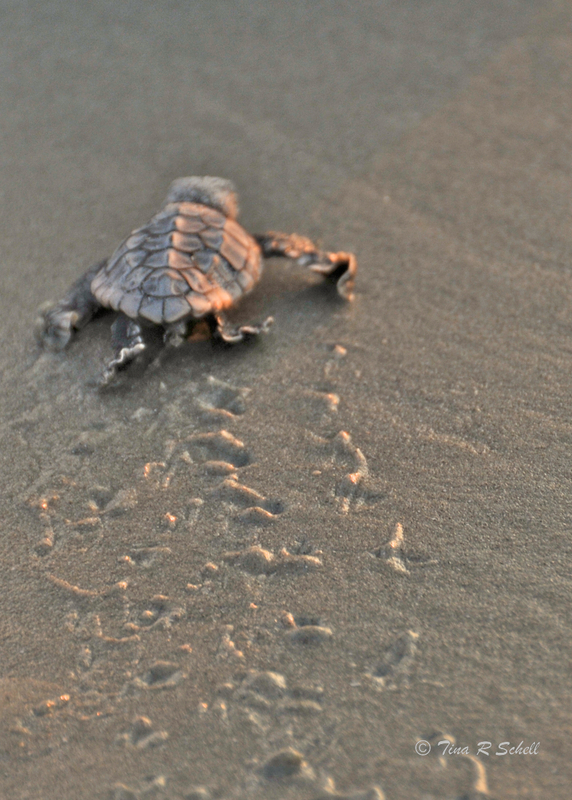 wow what a thrilling experience to see a turtle hatch and walk into the ocean. I’m so glad I saw this post! Where do you live Tina? Hi Rosanne, yea they’re fantastic. I live on Kiawah Island in South Carolina. We get between 150 and 200 nests each year in the springtime. So glad you found the post! They’re something aren’t they Madhu?! Your comment on Frizztext’s post prompted me to revisit them. These sea turtles look very beautiful, Tina. Nice shots! Your pictures are beautiful, as always. Wish you the best for the challenges and an awesome 2013! Thanks so much Juls! Happy New Year to you too. these are beautiful! i, too, posted about the sea turtle hatchlings. how my heart swelled as i scrolled down your post and appreciated every nuance! Thanks for your lovely comment and for the ping back! Loved your turtle post but am on iPhone so will look more closely at home. “see” you then! Thanks Tina! I really appreciate your advice. I’m off to check your weekly challenge. I love the last turtle photo. Really great shot. Your words with the images are lovely Tina . Thanks PT! It was interesting how emotionally involved we got so quickly! Wonderful! How lucky you are to have the opportunity to see this! What a sweet story. 🙂 What a brave turtle. She was amazing. Quite the struggle but she pushed through. Thanks for your comment! I particularly love these photos, Tina. Since moving to Jupiter I fell in love with Loggerheads, and visit our hospital for the hurt adults and baby hatchlings at least every month!! Great photos!! They are wonderful. I went down to watch some rehabbed ones get released. Very special. Thanks kiddo! That is a wonderful story for the challenge of the new beginnings. The quotes go perfectly with the photos. Thank you, Tina! Thanks Tom! You didn’t get hidden in spam this time. Maybe your troubles are over. Wow, how special! I love your quotes too, so great to remember them daily.